Pacific Heron and Pacific Egret arrived safely in Japan on 21 of September and delivered their cargo of 16 MOX fuel assemblies to the Takahama Nuclear Power Station. The vessels departed from Europe on 5 July 2017 carrying the fuel assemblies which were manufactured in France. 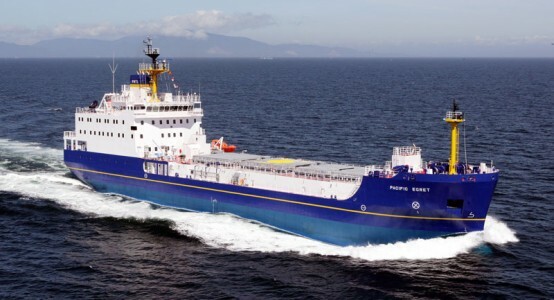 PNTL, a subsidiary of International Nuclear Services (INS), has been transporting nuclear materials between Europe and Japan for more than 40 years and has a flawless nuclear safety and security record. Our purpose-built vessels are state-of-the-art and are manned by some of the most experienced nuclear mariners in the world. This voyage demonstrates again the ability of PNTL to transport nuclear cargos safely and securely around the world. “We’re delighted to have successfully completed another shipment of Mox fuel to Japan. It’s another demonstration of INS and PNTL’s extensive and proven expertise in nuclear material transportation.